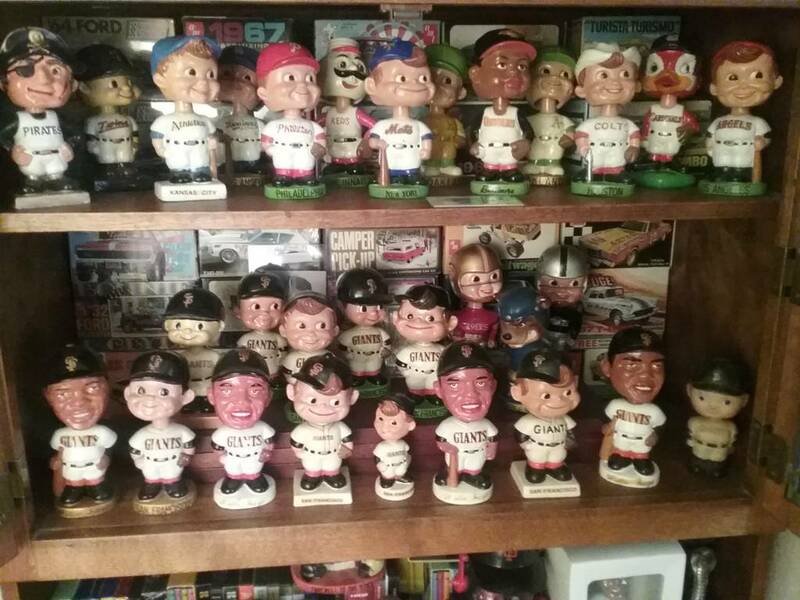 Let's See Those Bobblehead Collections! Beautiful collection Dwr11. 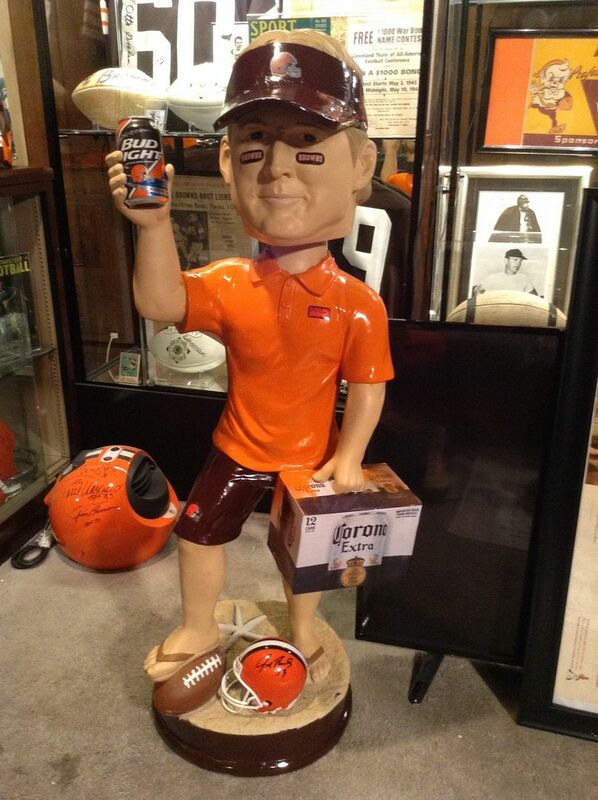 I love the vintage bobbleheads and figurines. Also love the buttons and magazines you put in the cabinet to display with the bobbles. Holy cow, Bob! Do you still have the Bathing Beauty and the hip nodder? Not as rare as Bob's weirdos, but I thought I would post my Willies. L to R: gold base (expensive but obtainable), legible signature (rare), dark face w/bat, light face w/bat, light face w/ball, silver foil sticker. Lou Criscione sold me the silver foil years ago and said it was extremely rare. I've never seen another. Wow, some gorgeous bobbles and figurines being shown. Bob, Rob and DWR, Fantastic collections you all have! 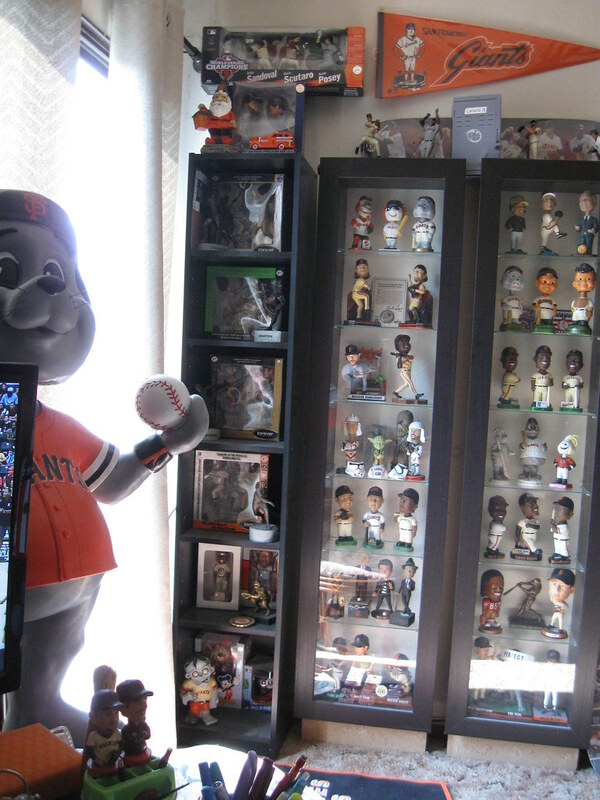 Geez Rob, only one row of Mays Bobbleheads? Just kidding, Impressive. Bobbleheads, wow. I wish I had a better feel for the pulse of vintage baseball memorabilia. Here are some of my Dodgers bobbleheads. The minis have so many variations of head styles that I'll be able to add to my collection slowly over time. For example, they come with hair parted to left, hair parted to right, moon face, smiling with a closed mouth or showing teeth. They also have them holding a short bat, long bat or a glove and ball. I also posted pictures of a variety of the square base Dodgers and some other miscellaneous ones as well. I regret not buying one of the weirdo nodders that Bob was selling (I think about a year ago). ggary, I love those vintage bobbles. I always wished the Yankees has as many variations as other teams, like the Dodgers did. I have never seen a Dodger bobble with the LA separated on the cap and Dodgers in red script. 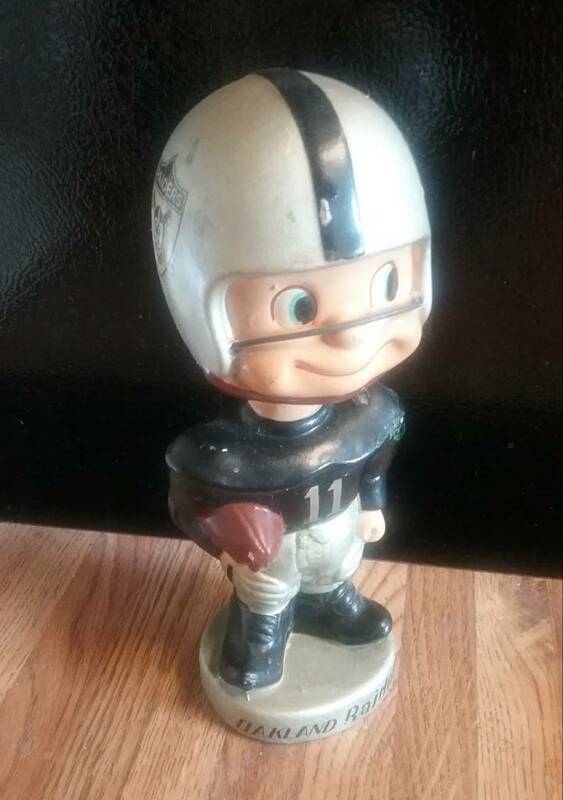 How rare is that bobble? As much as I hate the D**gers, those are some great nodders! The Giants minis come in the same variations. You forgot to mention “eyes left” or “eyes right.” The Giants have that variation in the normal size but I haven’t seen it in the minis. Some Giants minis also don’t have painted sleeves. The guy between the orange wood base and the Buddy Flex...what’s he made out of? Did you see the screwball Dodger on eBay, a few weeks back? YankeesJetsFan, that is a wedge base nodder. According to the nodderpriceguide it is rated as an 8 out of 10 to find difficulty (or a little harder to find the Werdo screwball [7 out of 10 difficulty]). ooo-ribay, thanks, the red base nodder is made of rubber. It looks very similar to the Buddy Flex but, besides their bases, they are not exactly the same. Also, I did see the screwball on ebay but the one I have is in better condition. Which nodder price guide do you refer to? I use Warman's Field guide. I am looking into picking up Tim Hunter's Bobbing Head Dolls book soon. I'm always looking for books or price guides to refer to in my collecting adventures. ^^^^ Both of those guides are great for the pictures but pretty hit and miss on price. I think Tim Hunter’s is 18 years old and prices keep going up, up, up. It's weird, Gary....1/4 of you D**ger minis are looking the "wrong" way....I have never seen a Giants mini looking anything but left. Also, notice two of mine do not have the painted sleeves. YankeesJetsFan - I used the nodderpriceguide.com for relative rarity. ooo-ribay - The eyes looking the opposite way seems to be common with the moon face with the swirl hair. If you look at Bob Freedman's photo again you can notice that his is also looking the "wrong" way. I thought I would post my Willies. Nobody wants to see your willies. I thought this was a family site. I only have a couple but have one college football I can't find any data on. It is in a box and has Japan on the bottom so I presume it is from the 60's. Could you post a better pic? I'm guessing this is the toes up bobble from the 60's? I'll have to refer to my guide when I get home to be 100% sure. See what I can do. Thanks. For some reason the system is not letting me upload pictures?? I have before. I can email them to you if that would help. I am not a big bobblehead guy, more into other figures like Hartlands, Southlands, HOF Busts, Signature Miniatures, Robert Goulds, Big League statues, Wickhams and the Aurora Greatest Moments in Sports. Last edited by whiteymet; 04-23-2018 at 04:20 PM. Sooooo....I saw this "Giant sized" SF nodder on ebay...the seller wanted $460. The bobber itself was old but the decals looked all wrong. I discovered it is part of the "Champs" series...they also did basketball and bowling. I picked up the baseball version and made my own fantasy peice. Better than the $460 version, IMHO. 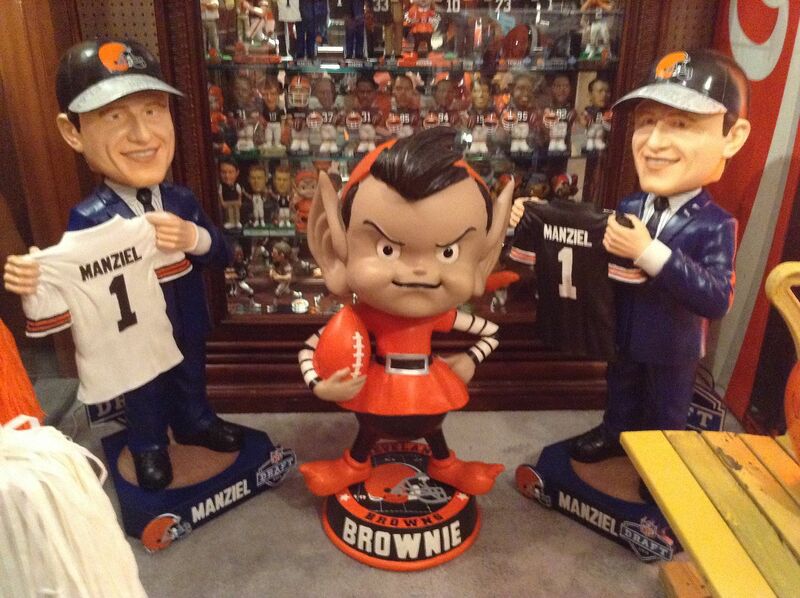 That and the giant Manziels.....were they sold or used for promotional purposes? 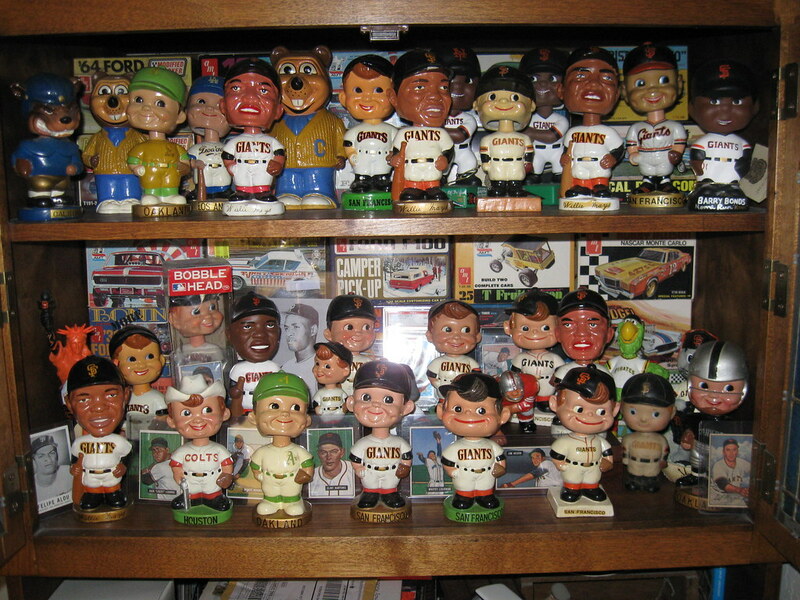 I have never seen that Giants bobble before. Could you please provide more info on it? Beautiful Expos Bobblehead! A very nice find. 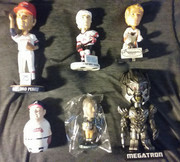 Does anyone out there collect bobbleheads of Net54 members? Awesome Gary!!! Are there going to be autographed versions available? 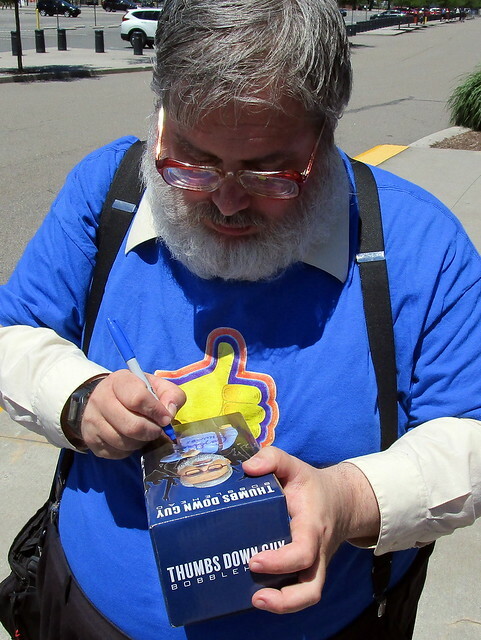 Not in the sense that you can order one from the manufacturer, but if you happen to run into me at a ballgame and you have one with you, I'll be happy to sign it. I really like how you have the nodders displayed; NICE! Couldn't reply to each of these great collections... But enjoyed so many. Here are the most recent acquisitions. And I thought I was the only one with horse racing jockeys and horse bobbles. I sell more than I can collect. I recently picked up a couple of "Catman" Willie Mays nodders (flanking the vintage Willie in the middle). The two outer nodders are also Catman and were limited to 24 pieces each. These were made by a guy in Canda 15-20 years ago. I'm not sure how he made the "realistic" Mayses because they are very close to the vintage but not exact (for example, the hat crest is embossed and not a decal). The white base sold on ebay a few weeks ago for $227 but then the buyer demanded a refund and left negative feedback saying it was "repainted junk." Uh, no...it's a Catman. Dude should have known by the painted chest. I got it the second time around for $100. There is also a realistic Mays in a NY road uni and a caricature Bonds that was limited to 25 pieces. I am on the lookout for both. I think Jimm has them. Last edited by jimm; 09-26-2018 at 05:54 PM. Wonder if they started cranking these out again? I've got a few hundred (modern) bobbles and have been looking for a way to display them. No room for bookshelves in my "cave", but I don't trust shelves hanging on the wall since I'm worried they'll bobble themselves right off the edge and fall onto the floor. Just bought 14 of these from IKEA, by my calculations they should hold 8-9 standard sized bobbles each and I'll feel like my little guys are safe behind a bar without being obscured. Those ought to work well, David. I used Ikea “rails,” turned upside down. Mine don’t have the safety bar feature. Those look good too! Was getting ready to purchase some picture ledges from Target when I found these new IKEA guys. They should arrive today, looking forward to putting them up this weekend. You guys should come to Milwaukee to the National Bobble Head Museum. I believe they have over 10,000 different Bobbles.